The short but glorious British asparagus season is underway now, and we can enjoy this fabulous vegetable in its prime once again. Be sure to make the most of it while it lasts as it’s only here until the end of June. The sooner you can eat asparagus after picking the better, as its sugars turn to starch very quickly, so try to buy it as fresh as possible and don’t leave it lying around for days in the fridge. It hardly needs any cooking at all – just 3 to 5 minutes depending on its thickness – and you can boil, steam, grill or roast it; you can even serve it raw. 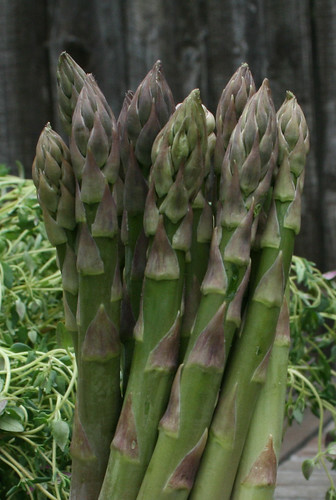 Asparagus not only tastes fantastic but it’s really good for us, being full of vitamins. It’s particularly good for pregnant women, as it’s high in folic acid; 80g contains 60% of the recommended daily allowance*. It’s also said to be an aphrodisiac so perhaps a good pre-pregnancy vegetable too! 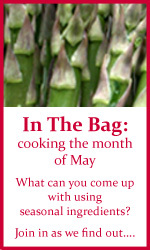 Over at Real Epicurean Scott is hosting May’s ‘In the Bag’ event and how could we not make asparagus the feature? The bag also contains eggs and parmesan cheese for you to whip up a dish with. You can make all kinds of dishes with that combination, whether classic or something more original. 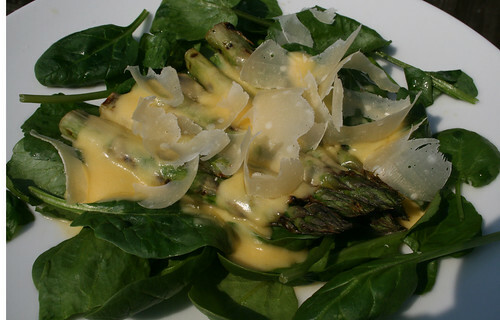 I’ve opted for classic for my entry with the indulgent, buttery hollandaise sauce poured over griddled asparagus; a fantastic combination. I made this into a salad with spinach, watercress and shaved parmesan.